I am in full agreement with whoever dubbed oysters as the perfect food. 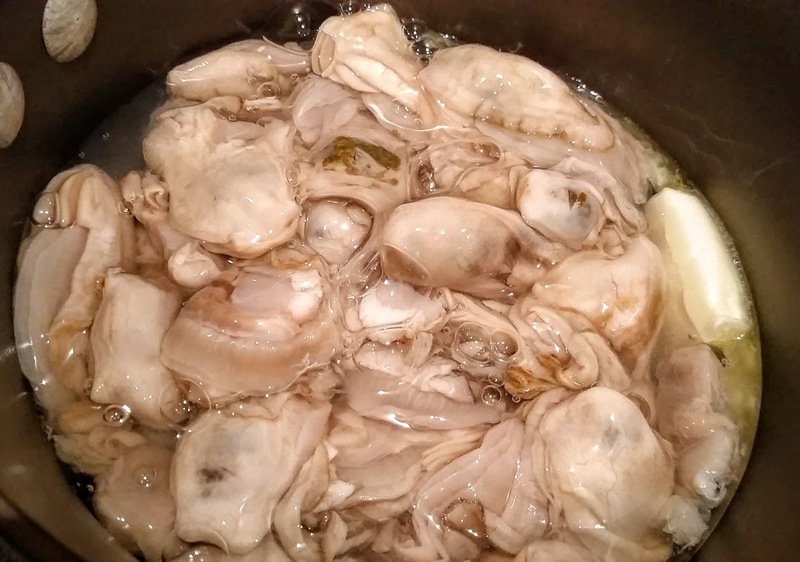 I love them prepared in any way: freshly shucked on the half shell, baked in a pie, fried, barbecued, or in a stew or gumbo. I grew up in southeastern Pennsylvania, which is in the Chesapeake Bay watershed. Oysters were plentiful there. We even had a “fish man” who delivered to our front door! We knew we would eat well on the day the fish man came calling. I don’t recall our family eating oysters in a month without an R, and I do remember the anticipation of oyster season coming ahead. They can be a bit spawn-y in warmer months, but I see Chesapeake Bay oysters in the stores all year around. Up until recent years, oysters were relatively cheap, yet delicious protein. When I first moved to Virginia in 1985, I drove by a seafood market every day on my way to and from work. Often on a Friday after work I would stop in and buy a peck or a half bushel of oysters for the weekend. A peck was around $7 and a half bushel was $12. I’d eat as many as I could over the weekend and then shuck the rest for frying or stew. What a feast! These days oysters are a little more expensive, but still worth every penny. I buy bags of 100 oysters for between $30-40. They keep perfectly fine for a few weeks if you keep them in an open container in the fridge and loosely cover with a damp towel to keep them from drying out. 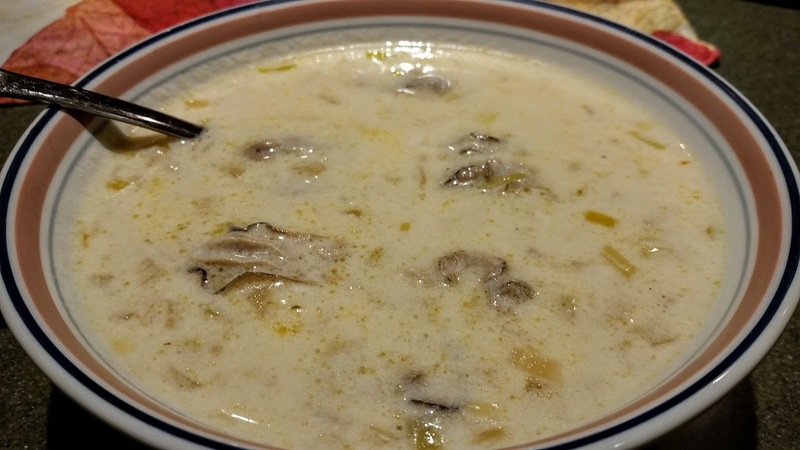 Oyster stew is a very popular dish in our family. This recipe has been passed along for many years. My great-grandparents probably enjoyed this recipe in the peak of the Chesapeake’s commercial oyster production. I did make a few improvements to it (adding leeks and hot sauce), but I am certain my ancestors would approve. 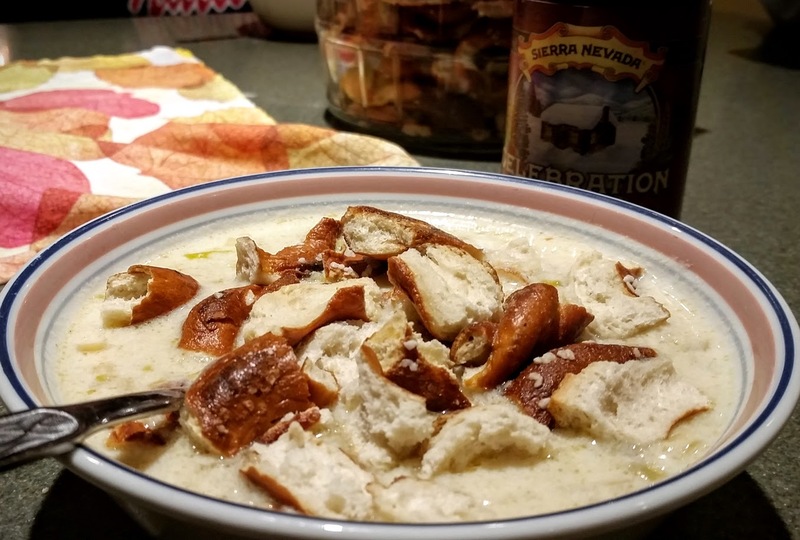 It’s our tradition, for as long as I can remember, to have this oyster stew as part of our Christmas Eve feast. We also have it as a warming weeknight meal when the weather is cold and a hearty soup takes that chill right off. 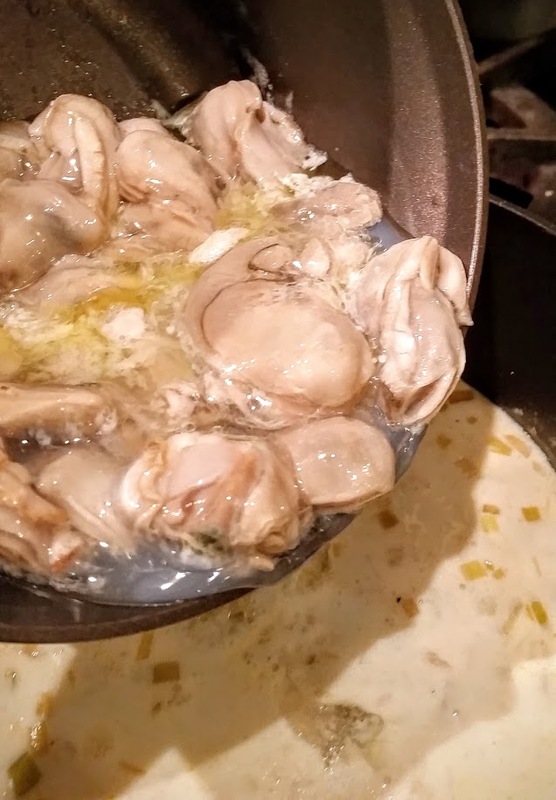 Place 1T of the butter in a small sauce pan, pour in the oysters and their liquor. Put the pan on the stove on the lowest heat. You just want these to get barely warm and for the butter to melt with them. In another larger sauce pan, melt the remaining 2T of butter over med-high heat. 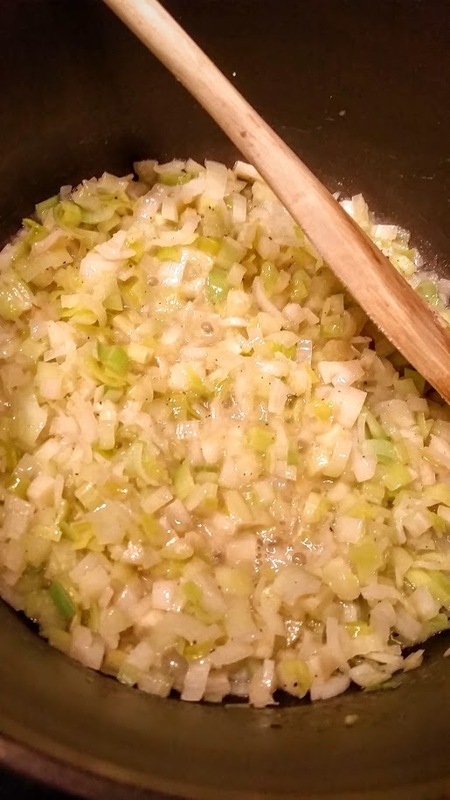 Add the chopped celery and leeks. Cook the vegetables until they are very soft, but not browned. Add Worcestershire sauce, hot sauce, salt and pepper. Stir in the flour until it coats the vegetables and turns a pale tan color. It will smell a bit toasty. 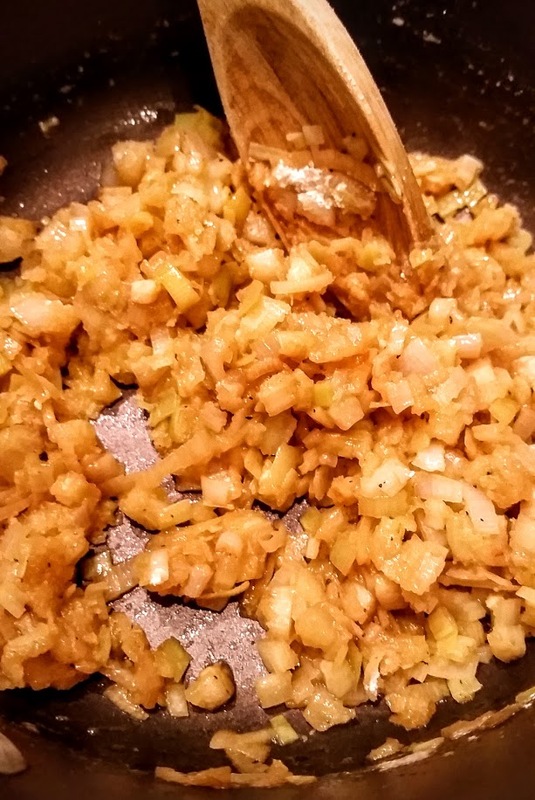 The pan will appear somewhat dry so keep the vegetables moving so they do not scorch. Add in the milk/cream. Milk is more sensitive than cream; if it boils, it will break. Turn the heat to medium and stir continuously until the milk thickens and forms bubbles around the edge. Pour in the oysters and their liquor, stir, and serve. It’s traditional to serve this with oyster crackers, but I really like broken hard pretzels and maybe another dash of hot sauce in mine.